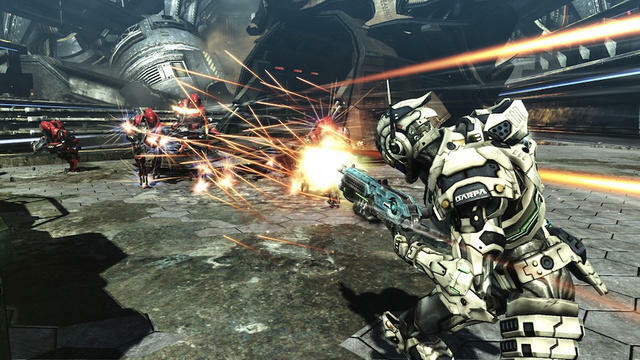 Vanquish is making its way to the PlayStation Store this week, and if you are one of the many who haven't given this gem a try, now is a better time than ever. The low price of $19.99 is well worth the heavy dosage of robot pulverizing shooting you'll be getting out of this one. Platinum Games' masterpiece shooter is the kind of ballsy game Capcom used to make before chasing away their most talented game producers. If you're tired of the modern warfare aesthetic that dominates shooters and just need something fun and entertaining that harks back to good old-fashioned 1980s robots, then there really is no question about it. You have to play Vanquish. I don't know what I like best about the game between the large scale scope of the backgrounds, the ludicrously busy battle animations, the strong mechanics and solid shooting, or the perfect length that somehow just knows when to end itself at the point you are growing tired. Trust me when I say Vanquish's shallow narrative pays-off ten fold in its final cinematic compared to what the most complex RPGs wrap up with. It's worth the wait. The game is also available through the Xbox Live Marketplace for $19.99, and although they are nearly identical, Platinum Games said the Xbox 360 build was the main build. Make your choice however you want, just play this game!